Simply, this book is just beautiful. I highly recommend it to all ages. Savannah Dreams is an engaging story that contains repetition, humour and most importantly delivers a likeable main character. The story and images work well together to offer a warm insight into community life. In this book we follow Savannah, the youngest girl, and her family as they go hunting or gathering food. Savannah’s ‘help’ is usually of the trinkets-and-treasure-hunting-type and she finds no food at all for a week. Finally her persistent dreaming and creating pays off and she catches the biggest fish of all. One of the lovely aspects of the story is that it takes us on a journey in and around an outback community, and we learn of bush tucker in the top end region where the story is set. The family hunt in the creek so we learn of mottled rock cod and stripy mangrove jacks. When the family walk in the mangroves we learn of blue-shelled crabs, sweet-tasting red claw and mud mussels. They hunt on the plains, near the billabong and finally visit the community store. The illustrations depict all of the community areas as a realistically positive and warm place to live. Illustrator Elaine Russell is an incredible artist. She has authored and illustrated her own books, which include, The Shack that Dad Built, based on her life in La Perouse and A is for Aunty. Elaine is famous for her bold colours and depicting scenes from a bird’s eye view. She uses simple shapes with an attractive blend of colours and lines throughout the book. Lolla Stewart has a number of titles under her belt, including Aussie Slang Dictionary, The Little Book of Household Hints and The Dream Dictionary. She has written this story with a sweet dose of humour and likability. 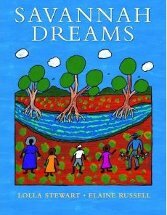 The combination is a successful one and I recommend this book for the joy of reading and as a learning tool – that is for an insight into bush tucker specific to the top end and the style of artwork used by Elaine Russell.